It’s Grand Final week, if that isn’t an excuse to do some major Scrambling, I don’t know what is!!! We have made it! Grand Final Week is finally here. If you have made it all the way to the Grand Final, well done. You clearly know what you are doing and probably don’t need my help! But hey, don’t tune out, hopefully I have some little bit of advice that might just help give you the edge. Last week was such a massive scoring week, don’t get lulled into a false sense of security. We all know that the Fantasy Gods like to play with us and I will predict that this week will be no exception! So keep your wits about you and make sure you dot every i and cross every t on your way to lockout. So, for the 23rd and final time this year…… Let’s SCRAMBLE! There are a million things that you will worry about as you head into the grand final. I guess we all have our own plans, here are a few of the things that I consider. Go Unique. If you think you are the underdog going into your final then look for a unique that might just have a big one. This is where you would be consulting Cal’s Scale of Hardness to see who has the best matchups. A few that spring to mind would be Port against Gold Coast, Richmond v St Kilda, Brisbane v a depleted North Melbourne at home and Essendon v Fremantle. So you may want to consider guys like Ebert, Boak, Ryder, Wingard, Grigg (who was massive last week), Zorko, Beamer (but a lot of teams have him), Heppell or even a Zaharakis. I know that these names aren’t generally ones that you would be looking at but they are guys that can pull a big game out of the bag occasionally and they have the matchups to do it this week. But beware, this is a risk and whilst they can put in a great game, they can also put in a real stinker too. Match off Risks. If you have a look at the matchup and there is just that one player of theirs that worries you and you think the rest of your uniques have them covered, then consider trading out someone in your side and bringing in that unique that they have. This then nullifies that risk and you can hopefully get over the line with the remaining players in your side. Captain. This one goes without saying. Yet again, have a look at their squad and see what they have and you can make your decision from there. You can look at potentially playing a unique captain. If you have read Calvin’s Captains this week (what am I saying, of course you have) you could take someone a bit further down on his list that your opponent might not have. For example a Matt Crouch or a Docherty instead of the vanilla options like Titch or Dangerfield. Supercoach Trading Plan. I know that not all of you play Supercoach, but for those that do, this week offers you a bit of a unique way to get the edge on your opponent. If you have one or two trades left and you don’t have to use them at the start of the round to get someone on field because of an omission or an injury. You could look to hold that trade until later in the weekend and then decide where you need to use it. This could be due to your opponent having someone go big and you need to take a bit of a risk, or you might have put someone on the bench to loophole them and you need to take that score but don’t have anyone to bring on who isn’t playing. By keeping your trade until the last moment you need to use it, you can take advantage and either bring in a unique or you could even bring in a donut to take advantage of that big score on the bench. This is of course a risky play, but if you are experienced in doing it and confident that by doing it you will get the win, then it might just be a risk worth taking. Taylor Adams has been named despite a number of concerns about his status during the week. I am praying he plays as he is crucial to my draft team, but keep an eye on the teams tonight but also ensure you have cover as I won’t be at all surprised if he is a late out. They will give him every opportunity to play. Grundy returns from Suspension. If you have a luxury trade he could be of interest, he is up against Gawn, but big Max hasn’t been in the best of form. Ziebell is out again, succumbing to injury, this time his foot. Nic Newman returns, if you traded him out, leave him out. Dan Hannebery is out with a Hip injury! This is one forced trade for owners. Jasper Pittard isn’t a name I would normally put in this column, but if you are a massive underdog and looking for a bloke that can do the unusual, Jasper might be your man. Just one over 100 this year, but lots in the 90s and 80s. With a GC team that is out of finals, Jasper might just have a field day. Lachie Neale returns and if a lot of people traded him out when he was injured, he may actually be a bit of a unique this week if you decide to bring him in. Early readers of the teams may have noticed that the little master, Gary Ablett was named for the Suns, but about two hours later he was withdrawn from the team as his dodgy hammy didn’t pass a fitness test at training. Have we seen the last of him? I hope not, I do love watching him work, however, I am glad he won’t be dazzling me against the Power this week. If you are a big underdog, take a risk. You may as well go for it if you think you aren’t much of a chance of victory. Don’t trust the predicted scores. We all know these things lie, they don’t know who will get injured, who will get tagged and who will have a shocker. Banter. There is no better weekend to get stuck into your mate that you are playing in a GF and have a bit of fun, particularly if you are winning! It’s not over til It’s over. Just because you have a player have a shocker on Friday, don’t write it off, you never know what may happen. I mean who predicted Grigg’s 153 on Sunday afternoon! There we have it folks, another massive season of Scrambling done. At this stage of the year, there isn’t too much advice I can give, for some of us who are struggling for trades (in RDT or SC) or have no cash, we are just hanging on for the ride and hoping for the best. But realistically if you have made it this far and are in a GF, you clearly know what you are doing and are having a great season. I want to finish this year off by saying a massive thank you to a few people and shoutouts. Thank you to Roy, Calvin and Warnie for once again letting me write for you guys each Friday, I love bringing this to you all and I really appreciate these boys for allowing me to keep doing it. Thank you to all the people that I have played against in leagues this year, thanks for the competition, I hope I gave you a bit of competition although I didn’t have one of my better years. I did miss out on a cash league final or two at the final hurdle, but thankfully made my cash league GF’s in the Draft format. A bit of a shout out to a group of boys at my Son’s school who bring me no end of entertainment, I do love seeing their teams each week as there is usually a player or two that I don’t know (well, would never consider for my team) or in some cases, don’t want to know, isn’t that right Ben? I am sure Luke Brown will get a big score for you one day mate! But, Most Importantly I want to thank you guys and girls, the readers of this little Friday Scramble each week. Without you, this would be nothing. I thank you all for the support you give me but also for the support you give each other. As most of you know, I don’t get a chance on a Friday most weeks to log in and answer questions due to work and then I go straight to my local footy club to coach one of the junior sides and it is after lockout when I get a chance to read comments and what I love most is that you guys all jump in and offer ideas and suggestions to each other. It is brilliant and a big part about what makes DTTalk work. All the best of luck with your teams this week, whether they be going for Grand Final Glory or just to get your national ranking up a bit higher. I hope you have had an awesome year and I look forward to seeing you all again in the pre-season for 2018! I Like Beams and Wingard in that combo, they have the far easier matchups. Most pointless weekly article. If you need a captain check Calvin’s captain. You need to know good matchups go to Cals scale of hardness. Article offers little substance and the people who like it probably think Donald Trump is a great president. For next year Warnie must go. He is absolutely awful as a pundit. While Calvin and Roy are quite funny I’m at a loss to what Warnie offers? Besides advice for top 5000 finishes. This article has to go as well as the sillyness that is shahs who gives us the team sheets when we get the official teamsheets. Time to evolve and grow and sometimes this means being a little ruthless. Sad to see Jeppa go. The one dude who u could rely on. You do realise we get all this for free, at no charge, the fact that these lads go out of their way each week to provide us with tops and tricks is fantastic so cheers lads. Nobody is forcing you to read it mate. There is quite a lot of people out there that would take a lot from this article. I don’t see you putting your hand up to contribute. What’s the chance of Imac writing a column so we can troll him. These guys were offering free advice. If you want fun Imac, start investing in shares and get onto the Hotcopper website. Then you’ll have something to complain about!! Thanks to all who wrote on this website. Really appreciated your thoughts and it was my choice to read it or not. Most of all to all readers take responsibility for your own decisions! Thanks Dunny for your weekly scramble. I taken your advice two weeks in a row and it has got be to a heap of league grand finals. IF I hadnt listened to a voice of reason I would have flopped out and only made a couple of grand finals. Look forward to the scramble again next season. No worries mate, great stuff in making the GF’s Hope you win!! Sometimes it is better to shut up and be thought a fool, than to make a comment and remove all doubt. I, for one, rate Warnie the highest – he seems to put in alot of the grunt work. But I appreciate what all of them do, and all the writers on this site. Sure, some seem to offer a bit more than others, but you take out of it what you want. It’s always an interesting read. Well done, Dunny, and all the team, and thanks. Thanks Moose, I can tell you Warnie is a hard worker for this site and he does a lot behind the scenes. Hope you had a great season mate. Hi Dunny thanks for all your work this year ..think its about time you guys got a moderator …maybe let one or two of the trusted regular posters here do it ? All the writers put in their own thoughts. I’m sure we all have our favourite articles, but in the end, the decisions are your own and you have to take ownership of your own good or bad decisions. You can’t blame anyone else. Personally, I read the articles because they are entertaining and they make me feel a part of the football world when I live outside of Aus. Sometimes I agree with the advice, sometimes it is not so flash. It is all about judgement, and if it was easy to judge we would all have the same team and be up trying to split up the grand prize. And I like the articles being spread across the week so each day has some more entertainment. Thanks to the whole crew. Agree. Warnie is a punish and is always bullying Calvin on the podcasts. Banter with Roy and hard bully’s Cal. They are big boys, it’s all just a bit of fun. Bahaha, gotta love the harshness of the internet somedays! Thanks for all of your work during the season Dunny. I’ve found the scramble a great tool for me to confirm the trades I am making each week. You tend to mention strategy a bit more than the other guys, and I think that is really important with fantasy being so competitive these days. Thanks mate, I like the strategy side of things. Hope you had a good season mate. Actually make that Phillips, Kennedy or Deledio? Wow, tough call. I wouldn’t be confident on Deledio given that will be a tight tough game, as for the other two, I think they will score close to each other, but I go Kennedy. I for one enjoy all the contributors to dt talk. It has definitely helped me into two grand finals. Cheers mate, best of luck with your GF’s! Need help for my final trade of the year please!! Who scores more – Sheed at home against the Crows or Sicily against the Puppies?? Bringing in Sir Lancelot or Gray for 1 of them…. Also, many thanks for all your hard work!! As for who to bring in, I think Gray, he should have too many tricks for the Suns. As for who to drop? Wow, tough pick, my gut says Sicily after last week where he let us down, but the Crows don’t allow a huge amount of points. If I had to make a pick, I think I go Sicily out for Gray. Really though I think either combination of trades there should result in some good points. Big risk taking Sicily into a grand final. Good chance he would learn from last week and not repeat it, however, there are some match ups which are favourable for the home team i.e. Port and Dons. I would expect Sicily to have a quiet but solid game 70-80ish knowing he now is a target, and would be in the back of his mind. I would pick Boak, Wingard, Ryder expecting them to go big with Port wanting to secure a top four. The Dons are wanting to secure a top eight as well. Thanks Dunny for all your fine work through the Season. I’ ve picked up some good tips re strategy, etc and if it wasn’t for articles such as yours, and others, on this valuable site, I doubt that I would be in the two grand finals (out of 3 leagues) this year. I think Beams, that will be a bruise free game. But really, either should score well, no matter what the game is like, Danger always finds a way to get his points. IMac thanks for the laugh buddy. Ridiculous comments on all levels. Trump is a great president – voted in by the people and fulfilling election promises. But you are clearly far too ignorant to understand. Peace moron, better luck next year. No worries Dunny. Love the article, keep up the good work! It’s very much appreciated. Trade dalhaus to menegola or trade witherden to a premo in hibberd/houli/JJ? Thoughts, thanks! Who do you think I should get? I think Lloyd to Houli based purely on Lloyd’s matchup this week. Then for my upgrade thinking Shaw -> Doch? Could go GW to Graham for another 100000? Might give you a few more options for upgrade. Getting Doch somehow is a good option. Who would you play out of Scharenberg and Newnes? Have 132k in bank plus 2 trades, what to do?? Do i trade out rocky, Dahl or Witherden? Dahl I reckon. Rocky could go large against NM. Witherden/Dahl to Simpson/Lambert or Hodge/Wingard? Ryan to Scharenberg and Sheed to Boak? Which two to bring in out of Zorko, Merrett, Zaharakis and Kelly? Merrett has been quiet the last few weeks. I think Z + Z will be tops this week. Should I go with Witherden/Ryder or Beams/Buzza ? Have Burton (in Def), Darcy out and only $9k in the bank. Any ideas on the combo to bring in? I have no coverage in defence and Adams on field which is a concern. I have Buzza as coverage in the ruck. Who to field gaff or alex witherdan ? Witherden has the better matchup, so tough call. If it were me I would go conservative and play Gaff, but it depends on whether you are underdog or not. Well done Dunny, another good effort this season! I would go Option One personally. I don’t know if I trust Hall playing at Adelaide Oval in a game that means nothing for them (watch me have to suffer through watching him tear the Power a new on on Sat night now I have said that). Gawn has struggled this year because of that injury, Paddy should dominate so I think I go Gawn to Ryder. Great work for another fantasy footy season Dunny, top effort Legend! Cheers Horned Beast! Hope you had a great season. Thanks Dunny, looking forward to having you back next season – an essential part of my weekly Fantasy routine! Got knocked out in my Prelim last week thanks to Hodge, just playing for ranking now. Good luck to all the GF coaches! Cheers Cricket, glad you enjoy my ramblings each week! What’s your view on Zorko tomorrow dunny? Trust fagan and take his word that Zorko is in or trade him to Gibbs just in case ? No worries, the antibiotics have well and truly kicked in … he’ll go like the clappers! Trade out dahlhaus or Riewoldt? & who to bring in – Boak or Menegola? Dahlhaus before Riewoldt this week for all sorts of reasons, including the extra cash advantage and prospect of a higher ceiling. Even if he is only half as good as he was last year (remember his final round score? ), that would have Riewoldt tonning for you! I offer that comment somewhat under the influence of my earlier in the week rage trade of Dahl, who I have had all year, born him with great frustration, and have only now this week managed to trade him out! And guess who for? I have also traded out WHE and brought in Boak (but I already have Menegola). If I didn’t have Menegola, though, who would I pick between him vs GWS and Boak vs Gold Coast? Boak has a much better chance of going huge even if both he and Menegola could be expected to score well for you. Have 587k to spend on a midfielder… go! Ebert, Kennedy, Heppell, Wingard, Oliver or Whitfield – which would you go with? Or none?? Kennedy and heppell will go over 100 for sure, wingard if he’s not tagged could go bigger at home. Touk Miller is a new tagger so anything could happen. Depends on if you want to take the risk or not. Thanks, Ray. Didn’t know about Touk being a tagger – thanks for that insight! Here’s my dilemma, Tuohy is up and down and capable of a 60’s score, will Hodge want to come out and play an absolute blinder in his last game or spud it up a 2nd week in a row. Dahlhaus has been horribly inconsistent with a last 3 round average of 74. Yuck. Then old yo-yo Jack Steven, almost enough for my never again list but is capable of going big but seems lacks interest at times. Just not sure I can trade a guy off the back of 117. Prioritize getting rid of Tuohy or Dahl imo. Since you already have Hodge I reckon you may as well stick with the old bugger and hope he does what he should have done last week and smashes it for his farewell appearance! In: two of Meningola, Billings or Ryder? Thanks, Meningola is a lock. I’m 50/50 on Billings (form) vs Ryder (opposition). Field Sloane, Rocky or Dunstan in Draft? 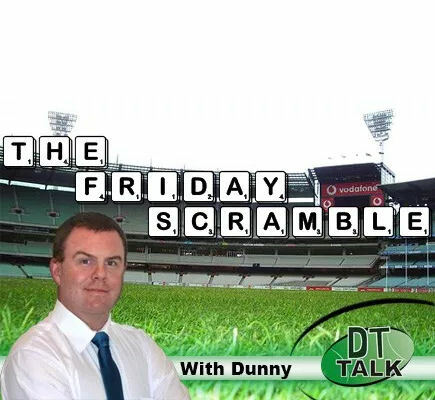 Thanks Dunny for your informative articles, cant make the final decisions on my team without reading Friday Scramble first. Didn’t quite make it into a GF but am sitting at 5182 in the overall rankings. Gotta be happy with that!